It is always fun to spend time with the Peanuts gang. 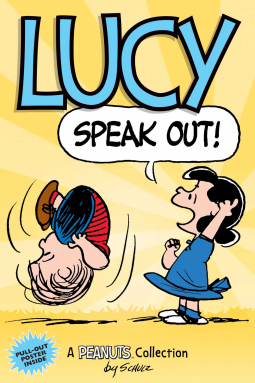 In this volume, Lucy certainly does speak out but she is not the only one. Visit all of your favorite Peanuts characters including Schroeder, Linus, Charlie Brown, Snoopy, Woodstock, Sally, etc. I was reading this while sitting at jury duty yesterday. The perfect antidote and one that left me laughing out loud. Many thanks to NetGalley and the publisher for a fun read. I loved Lucy so much growing up, and this cover is perfect for her! But, to be honest, I haven’t read many of the actual comics (though I loved many of the movies). I’ll have to check out this collection.